The aim of the Institute for Digital Healthcare is to enhance the health and wellbeing of UK and overseas communities, via the delivery of education. A distinctive range of co-produced, bespoke study options is being devised and delivered from within IDH. 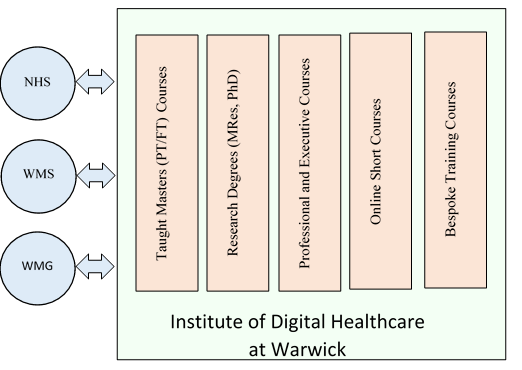 These include traditional programmes including PhD, taught MSc in Healthcare Operational Management (full time and part time); plus an evolving portfolio of digitally delivered short courses aimed at a very broad range of stakeholders. Many IDH courses are or will be exclusively delivered via technology-based learning platforms. This enables the training of overseas participants (negating travel and visa issues, thereby delivering education to those professionals and citizens who do not currently have access) and enables those in full-time employment to receive flexible training. All of our courses will comprise best-practice digital delivery. Content is of the highest quality possible, and is designed with clarity and purpose comprising evidence-based and state of the art information delivered in an accessible, interactive and engaging way.